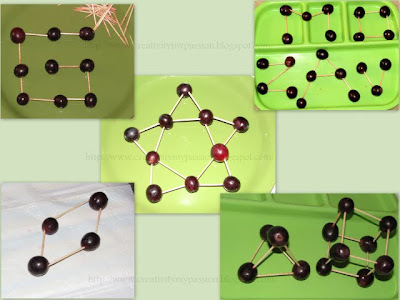 When I saw marshmallow and toothpick construction post @Pink and Green Mama Blog, my head was running with ideas on how to make shapes with something similar to marshmallows but not marshmallows. I have not given CJ marshmallows. She has a sweet tooth and I didn't want to add marshmallows to the list. So We made geometric shapes, 2D and 3D, using toothpicks and grapes as connectors. I showed CJ how to attach the grapes and toothpicks. With little help she created a triangular pyramid. After that she started playing around! After all the shape fun, CJ wanted to create some alphabets. She would say an alphabet and I helped her creating them. Here's our Alphabet tray! Watermelon cubes, pineapple cubes or for less messy version raisins can be used as connectors. Wow!! What a fun and clever idea!! I will have to remember this for when my children are learning geometry in school - this will be great fun and a lot of help!!! Thank you so much for linking up to Kids Get Crafty - it wonderful to see you there! We've done this with marshmallows, but I think grapes are a much better choice! Thanks so much for sharing!! I'd love to have you link up to my For the Kids Friday Link Party! Stop on by!! Love it! Really neat idea! I am having a giveaway on my blog. $38 store credit + free shipping from busy little hands to select any cute backpack for kids from her store. Check it out! I love the grape idea! Thanks for sharing it! Thanks for sharing at the For the Kids Friday Link Party! I look forward to having you back this Friday! i liked all of the posts you shared but this was my favorite, thx for sharing w/ the play academy!! What a brilliant idea, Esther! Health, play and learning all rolled into one. We have to, have to do this! LOVE the grapes idea! Also thought the same thing about marshmallows - at least these would be good if they ended up in their mouth! GREAT substitute! Stopping over from the It's Playtime linky. Thanks for sharing! My son will LOVE this! Grapes are such a good idea! I love this idea -- so I had to feature it this week with some other fine motor activities on It's Playtime! Thanks for coming each week to play! Esther - I did this using marshmallows in the classroom & the students always LOVE it. I like the idea of using grapes though - a perfect healthy treat to snack on after you are all done! Great Blog! I discovered your blog today and came upon the Grapes Geometry, 2D-3D Shapes page. I have a math games website geared towards kids from preschool up through high school. I love the idea of using grapes! Yum! Awesome idea. Can't wait to try it with my twin grandkids!